August 2004. Doctor Who is returning to TV in seven months. By the time Scream of the Shalka finished broadcasting on BBCi in December 2003, the ‘Wilderness Years’ were over and we were just marking time until the new series started. A sense of anticipation hangs over all of the tie-in ranges. The Eighth Doctor Adventures are in their terminal phase, having moved to bi-monthly publishing from September 2002, and concluded their final major ‘arc’ in January 2004. There are only three more books to go. Meanwhile, Big Finish had just planned to exile the eighth Doctor, Charley and new companion C’rizz to a divergent universe when the news of the new series broke. They have to accelerate the story arc and bring forward the Doctor’s return to ‘our’ universe. And while the books and audios are in turmoil the DWM strip quietly slips in, just as it had in 1998, the last time the ‘main range’ started to lose its momentum. The final eighth Doctor strip, The Flood, ran for eight months, its last instalment coming out the same month Rose aired on BBC One. The DWM strip was in a unique position in 2004. Whereas Big Finish didn’t have the rights to use the ninth Doctor (and would have been unlikely to get Christopher Eccleston in any case), and the books were changing format to tie in to the new series, the strip was continuing – just as it had in 1985, 1989 and 1996. 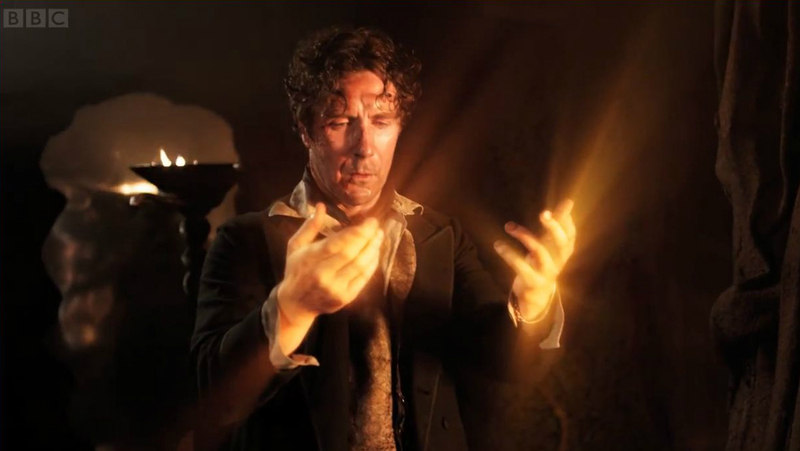 Which is perhaps why Russell T Davies chose it as the medium to show the eighth Doctor’s regeneration into the ninth. Most of all, The Flood feels contemporary in the same way as Scream of the Shalka: not, like the old UNIT stories, set ‘a few years hence’, but bringing the alien menace to Earth, today. But while Shalka was set in a Lancashire town, off the beaten track and deliberately overlooked by the media, The Flood is in your face in London: brash and bold. In its final panels, the eighth Doctor touches everyone in the world in the kind of universalism we’re going to see in the Davies series finales. The strip got a lot right – but that’s not surprising, because Davies loved the strip. He loves cartoons. In the ‘making of’ stuff for Series One there’s even a little picture of Lady Cassandra he drew to illustrate his script. Of course he was going to offer the regeneration scene to DWM. This was our eye-opener… Our cosy little cottage industry was now a fully-fledged brand. It was a major, multi-million pound BBC One series with clever people at the helm, and we were short-sighted to think we could cling on to what had gone before. Essentially, Davies politely but firmly ended the DWM strip’s semi-detached relationship with continuity. It was going feature the ninth Doctor and Rose. The eighth Doctor novels were going to end. Big Finish continued, but was not allowed to use any elements of new series continuity. The fan-led ‘Wilderness Years’ are officially no more. For the first time since Peter Darvill-Evans, someone’s taking charge. The culture shock of 2005 was huge. Some fans still haven’t got over the fact that ‘their’ series is now the property of fangirls and children and Americans. The saddest thing about Doctor Who between 1991 and 2004 is that the series that was radically and brilliantly reinventing itself, but the only people who cared were the fans. On 26 March 2005 this is going to change. The ‘Wilderness Years’ are coming to television. Doctor Who is coming home.